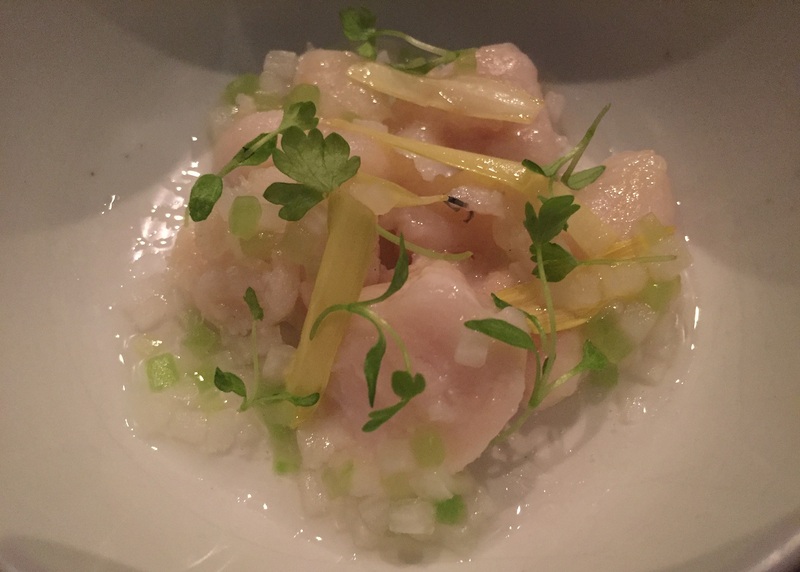 09 Mar 2016 in Food Essays ~ read. Food is identity, it's the most revealing thing about you, about a culture, where you come from, how you live, what's important to you... they go hand in hand. About a month ago, I watched The Search for General Tso, a documentary tracing the proliferation of Chinese food - more specifically, American Chinese food - across the United States. It was a good documentary because it did what good documentaries do: make you reflect: in my case, about my cultural heritage. When the first Chinese immigrants reached American shores, societal forces such as language barriers and racism prevented them from obtaining regular blue- and white-collar jobs, so instead they decided to start their own businesses: restaurants and laundromats (mostly). Communities were established; Chinatowns, enclaves of culture, helped integrate new generations of immigrants into American society by providing shelter and jobs. For more adventurous Americans these became something of a curiosity; they would venture in, discovering this alien culture and its artifacts, its traditions, its food. But the money wouldn't come unless the Chinatown restaurants tailored their plates to American tastes. This basically meant cooking with ultrafamiliar ingredients using exotic (at the time) sauces. Take some beef and broccoli, toss it in a pan, cover it with soy sauce mixed with sugar. Fry some chicken with cornstarch, dip it in a sweet and spicy syrup, sprinkle some sesame seeds on top... The authenticity of these dishes was perceived not from their cultural legitimacy, but from the yellowness of their chefs' faces. For some Chinese this was shameful, having to decant their cuisine ancienne for immature palates; hopefully it doesn't surprise you that people in China don't eat General Tso's chicken, chop suey, fortune cookies, much less know what these things are. But for many others, it was the birth of new opportunities, a new, Chinese American culture, globalization at its finest. 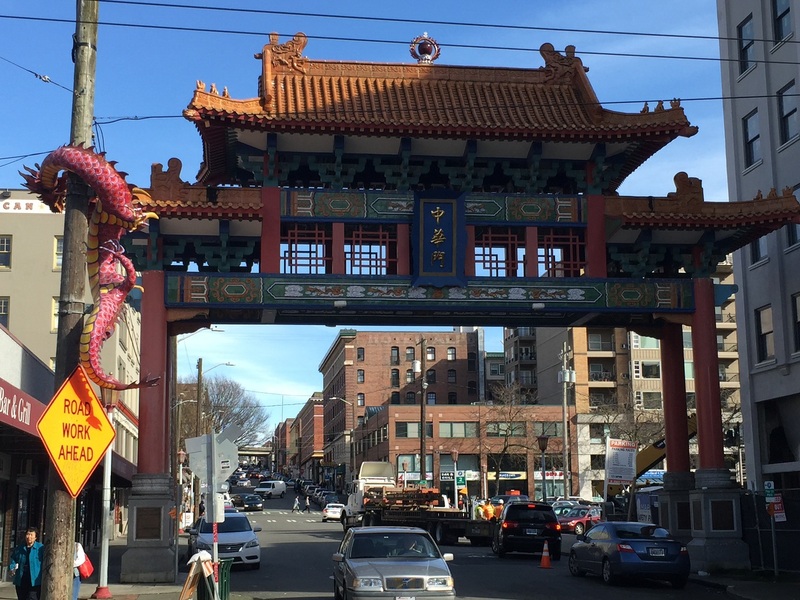 As Chinatowns became more populous, some families, seeking to make their own success, would migrate away from these hubs to start their own restaurants in cities with less competition. This cultural diaspora gradually enabled non-coastal Americans to sample this exotic fare, and they couldn't get enough of it. Fast forward several decades and you see American Chinese restaurants in virtually every locale across the country. What happens when the market for American Chinese food gets close to saturation? At this point, the immigrants have accumulated enough capital in their vocations to have legitimate purchasing power as a demographic. Money buys opportunity; here, the opportunity to rekindle their cultural roots. Chinese grocery stores pop up, importing lotus root, bok choy, and an alchemist's cabinet of medicinal herbs daily. Dim sum and hot pot spots abound in metropolitan neighborhoods. Some dishes, like pork buns, xiaolongbao, and knife-cut noodles find their way into the evolving tastes of American gourmandism and become veritable foodie sensations. Consider a three-tiered pyramid in which the tier-three groundwork laid by the General Tsos and Egg Chow Meins allowed for the construction of tier two: more authentic Chinese food. 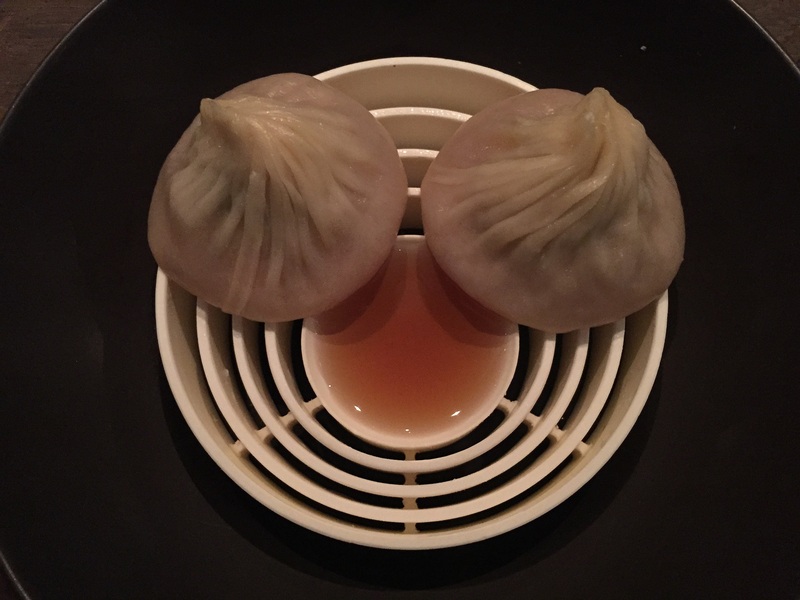 Tier one represents the pinnacle of classical Chinese cuisine, and to date, few places stateside have attempted to crack it. This is partially due to terroir and partially due to demand. The best restaurants in China tend to have ornate, expansive dining areas. Families sit around large tables and typically one person orders for the group numerous dishes of varying size, which gradually appear on top of a rotating glass disc in the center of the table. This gets spun around, allowing diners to translate food from each dish to their plates at their leisure. Watch the movie Eat Drink Man Woman, by Ang Lee of Life of Pi and Crouching Tiger Hidden Dragon, because it depicts this dynamic better than can any of my adjectives (and because it's his best film). The food at this level is, needless to say, exceptional. The best Peking Duck you can get in the States holds scarcely a candle to the beijingkaoya of Quanjude. You'll be hard pressed to find turtle bone soup or any of the "four delicacies" of abalone, bird's nest, sea cucumber, and, yes, shark fin soup - more on that later - anywhere here. If you somehow manage to, low is the likelihood that the restaurant actually prepares them well. Nevertheless, I have found such a place which does, and it is Benu in San Francisco. Benu isn't even a Chinese restaurant, but more, too, on that later. The first time I visited China, I was four. It wasn't so much a visit as a "let's bring our toddler with us because he can't survive alone in the States!" I remember nothing. The second time, I was ten or eleven, and I remember being amazed by the mysterious foodstuffs lining the shelves of Beijing's grocery stores. In one cooler I saw my first "thousand year old" eggs, which, packaged in plastic with their dark brown skin surrounded by little pockets of yellowish liquid, looked absolutely revolting. Not to mention the idea of eating something one thousand years old. In retrospect, this is one food I don't regret not trying as a kid. 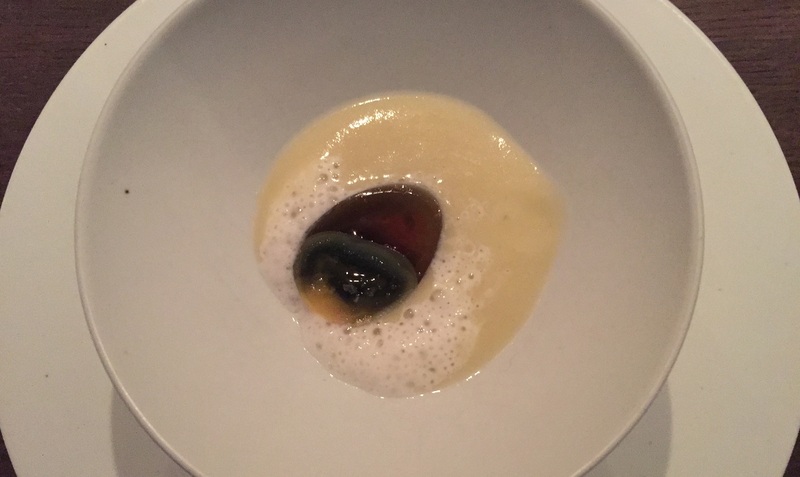 The albumen is gelatinous, tasting of vinegar and mild ammonia; the yolk a pudding, intense. Potage - buttery, rich, mildly chicken-flavored with an invisible pinch of cayenne - and ginger cream - a differently-charactered, more bracing, more refreshing spice - act as a marvelous background for the egg, mastering the dish. Oyster, pork belly, kimchi. Brittle, savory, spicy, creamy, briny, hot, cold, miniscule... A small, highly technical bite of an amuse-bouche. A Paganini violin caprice. Well, if this isn't just fried fish on a stick! Horseradish mayonnaise with horseradish shavings. I once tried eating cherry blossom petals off a cherry blossom tree. They were faintly floral with some bitterness. I wouldn't eat cherry blossom by itself, but here, reduced to a sauce, it cleverly offsets the pungent edge of the horseradish. A well-executed blended wheat. Crunchy rind. The soft, warm crumb yielded some wonderfully complex earthy aromas. 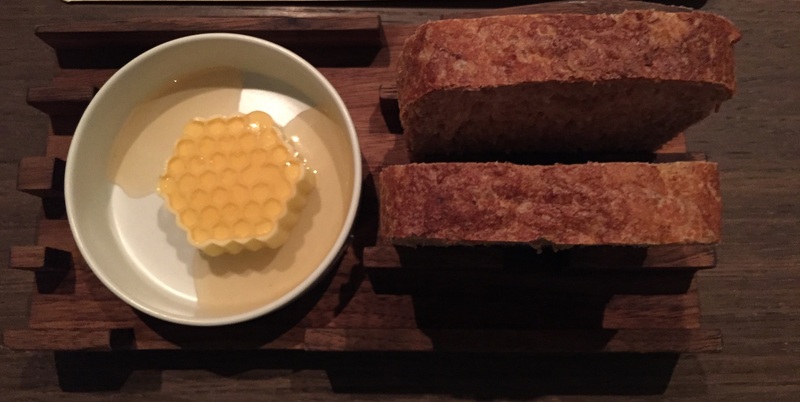 Butter with lavender honey added a sense of indulgence and luxury to something otherwise healthy, fibrous, straight-edge. Yuck! I can hardly think of a more unappetizing dish than the potato salad. Cold potatoes and hard-boiled eggs waterboarded in mayonnaise, with a dollop of mustard and discolored red cabbage. Just thinking about this triggers my gag reflex; you'd have to pay me to eat it. Luckily, this dish had none of the above. The carrots and caramelized anchovies were crispy and sweet. The potato, in contrast, was mashed, buttery, warm! Culinary yin-yang; through opposition, balance. A few microbasil leaves exist for visual contrast (and a soft herbal kick). 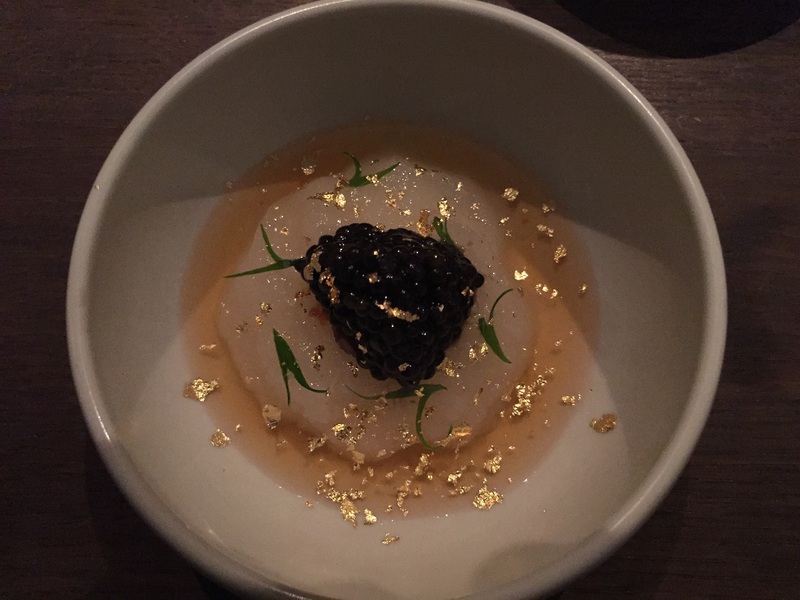 Caviar, cream of chicken, winter melon. In the West we frequently compliment what we eat because it tastes good. Have you ever heard anyone say "this has a really unique mouthfeel" or "this has an interesting texture"? Pretty rare, isn't it. But one of the hallmarks of Chinese gastronomy is its appreciation of texture, sometimes at the expense of flavor. The winter melon is a good example. Like the tomato, it's one of those fruits that's used as a vegetable in cooking - typically soups in Chinese cuisine. It's pale, almost translucent, and, like a chameleon, takes on the color of whatever it's placed into. It doesn't taste of much - just the slightest hint of bitterness - but the texture is soft, ethereal, when you bite into it it's like you're biting into something barely real. The ghost of a vegetable: unique - interesting - good. In this dish it surrounds a cream of chicken, which is itself surrounded by a clear stock of probably various fishes and herbs. The caviar sitting on top amplifies the other flavors with a burst of salinity. Nothing you see here is solid; you don't actually need teeth to consume this harmony of varying viscosities. It's got to look nice too, hence the pretty little chives and shimmering gold leaf... at the expense of my bill. Within moments of his stepping on the tram, he was sandwiched between two people: a clown, no doubt on his way to some carnival or birthday party, and a collegiate-looking professorial type. Sandwiched between Franz Ferdinand and Winston Churchill was a tenuous period for America, who in her insomnia could not Dream and thus became fraught with economic angst. People, time, bread... Here we have a sliver of fluke sandwiched between two sesame leaves. The surface of the sesame leaf is like a fine-grained sandpaper; chewing it you find that it's oddly crisp but mostly flavorless. If I had to put my finger on a flavor I'd say a milder celery. With trout roe, pickle, radish, and perilla. Though this wasn't bad, it didn't leave a strong impression. The flavors drowned each other out in a bold chaos. Quite pleasant. Fresh asparagus has one of the best textures of any vegetable. Biting through the stalk feels clean, even; the flavor is bright, earthy, warming. Crispy breadcrumbs and creamy aioli keep you intrigued as the sesame seeds add their special nuttiness. The onion shavings on top finish the dish with yet more textural nuance: crisp, but not robust like the asparagus. You can do a lot with tofu. This piece was delicate, soft, and gelatinous, sized just to float on your tongue. The sauce reminded me of pesto and some of the more bitter olive oils. In one version of the future, all we eat is a tasteless tofu containing the nutrients necessary for survival, sitting in various sauces for flavor. In another, we eat bowls of gruel. In another, we unknowingly cannibalize our own corpses. The problem with restaurants like this is that they always serve one or two things you wish you could eat over and over again. It's so good you tell yourself you'd be okay if it were the only thing you'd ever get to eat for the rest of your life. All you get is two bites. Uni-stuffed fried okra topped with finger lime caviar. The crunchy part, which is deliciously fatty and oily, quickly gives way to the sweet and buttery and creamy sea urchin, which has the same consistency as the gooey okra. 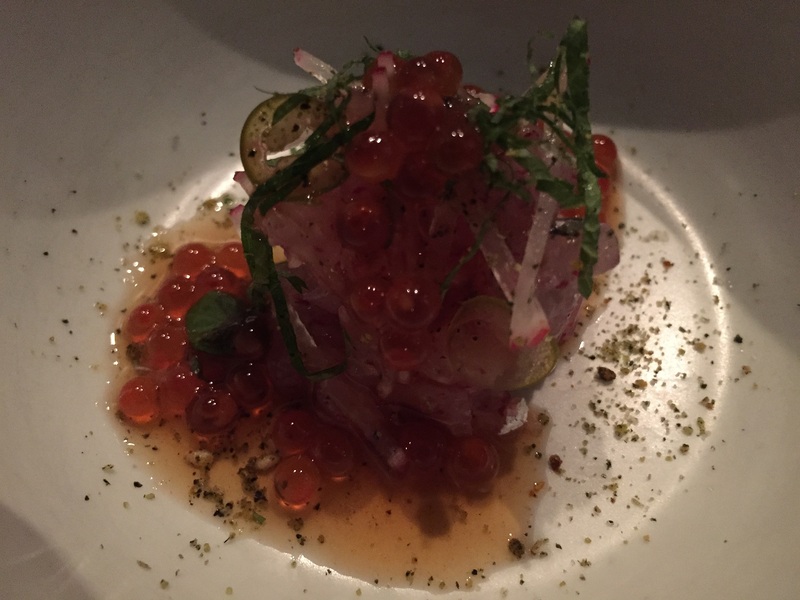 Citrus, present both in the nori vinaigrette and the bursts of finger lime, is a good flavor counterpoint. It means little dragon dumpling. 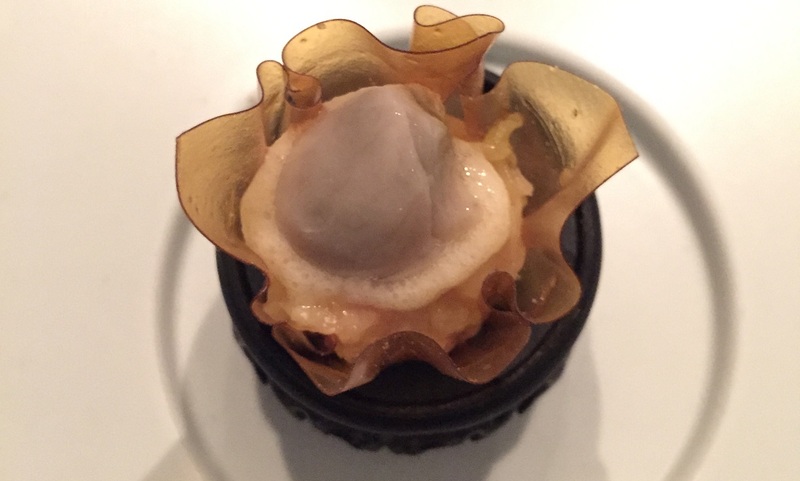 Chef Lee's version uses foie gras instead of the traditional minced pork. French ingredient, Chinese cooking. Foie, pork aspic, herbs; knead some flour around these to make a dumpling, then steam to cook, in the process melting the aspic into a stock. When you bite in, the stock pours out - it's hot! - before you get to chew on the flour, now wonderfully light and stretchy, and all the goodies inside. 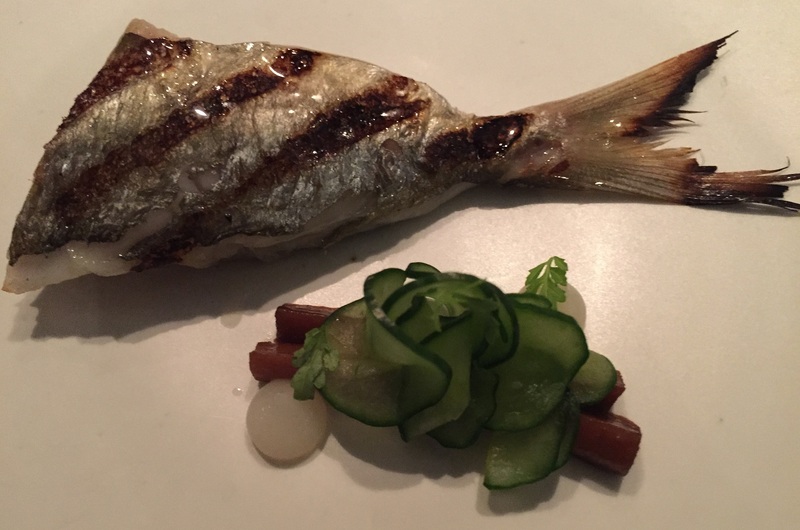 You can then dip it in the citrus ponzu to give it some zing, though it's certainly not essential. And though this dish is Benu's most well-known, I didn't find it much superior to the traditional version. One of the most powerful things about food - or anything, really - is its ability to evoke emotion. This dish was pure spring. Youthfulness, new beginnings, a thawing out, blooming, rejuvenation, transitions. You know, the kind of spring best captured by actual poets and not this your humble blogger. What's that, you wanted me to describe the taste? How boring! I've never had butterfish before. This one looks real pretty. Examine its brushed, glistening skin. The four mahogany grill lines. Its sinewy, cartilaginous tail, charred at the end, as if it had been partially eaten by fire. You can still see the imprint of its scales. 'Twas tender, delicate. Fish and sides - a common American aesthetic. But instead of carrots, broccoli, and potatoes, we have cucumber, burdock root, and marigold purée. 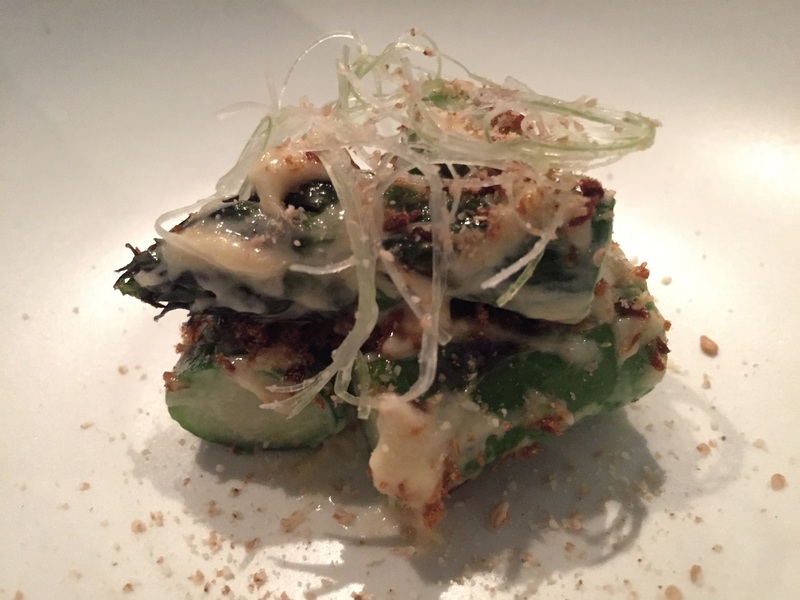 Burdock is one of those things you have to try at least once in your life. It has a distinct flavor, kind of like a fermented beef jerky with a touch of dark brown sugar, and the texture is tough and crunchy but somehow not dry. You know, I had the chance to eat a sea cucumber in a restaurant in China when I was little. There were several different kinds to choose from. I didn't understand the Chinese characters, but I did understand numbers, and the sea cucumbers with spikes costed more than the ones that looked like black pickles. Sad little me ended up ordering one of the non-spiky versions. I took a long time to eat it, cutting it up piece by piece, really savoring every bite because I knew it was special. I was sad to watch it disappear; every bite meant one less. This one tasted just like I remembered. Except this one had spikes, and I made sure to turn it over several times in my mouth to fully appreciate the texture of the spikes... Gee, what am I writing here, some gross alien erotica? No, you don't understand, it's these little things that differentiate the connoisseur from the gourmand. Always better to be a little weird. 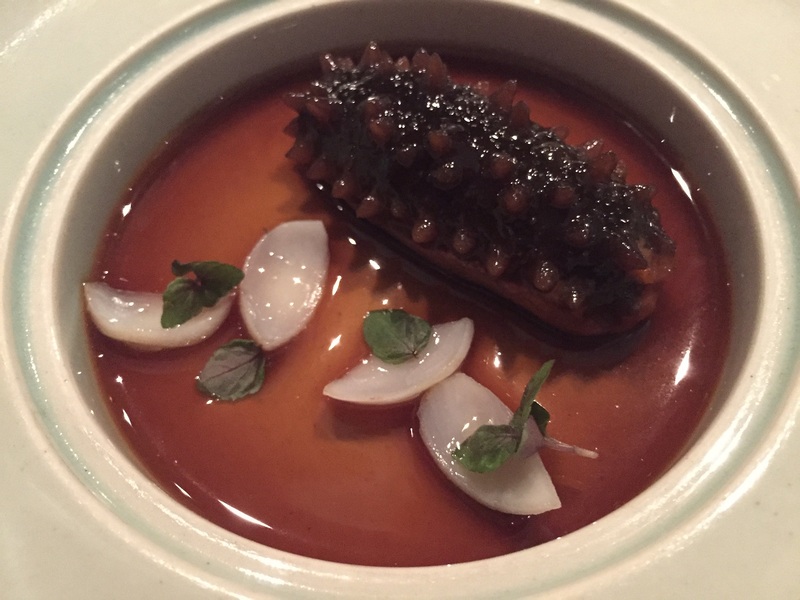 Chef Lee is so weird, in fact, that he's determined the best sea cucumbers in the world come not from Africa, or South America, or Southeast Asia, or China, but from the marginal Sea of Okhotsk, off the coast of the Russian Sakhalin. Tier one? Beyond. The sea cucumber is gelatinous, delicate, rubbery, slippery, chewy (a good 2-3 chews), and is great at absorbing the liquid in which it's braised - in this case, a deliciously spicy/umami sauce of fermented peppers. And furthermore, would you believe that this sea cucumber was carved out and stuffed with shrimp? Crazy weird! Crazy good! P.S. Those shallot-looking things are parts of a lily bulb, a common Chinese ingredient - crunchy and sweet. Perilla leaves leave a fresh, minty note in contrast to the thick and powerful sauce. Over the past five years or so, cauliflower has been all the rage for herbivores in the U.S. You can roast it, grill it, bake it - each produces a yummy result, and if you get bored, just switch up the cooking method. Consider me a big fan. But what's the next big vegetarian thing going to be? I'm calling it now: bamboo. It's incredibly versatile; here, it functions as a steak. Cooked properly, it's great fun to munch, very crunchy, with a flavor that continues developing with each bite so you don't get bored. 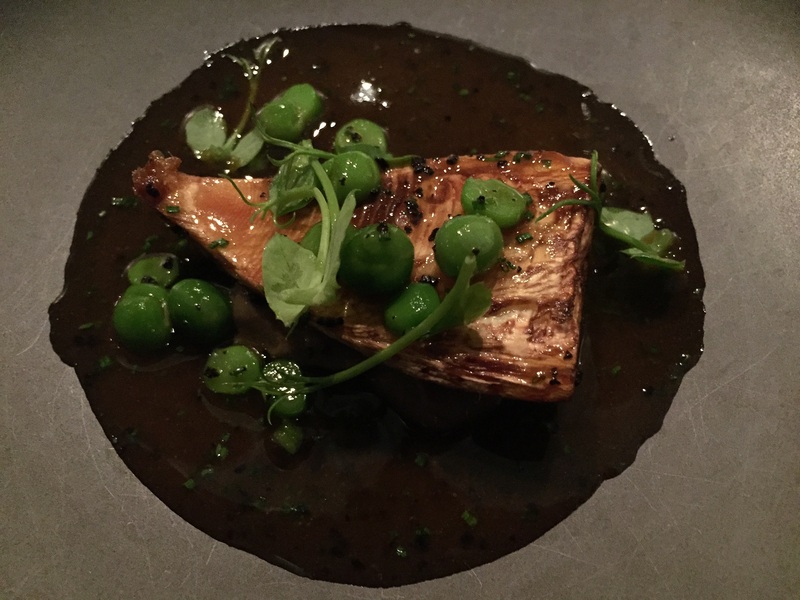 Here it's set in a truffled broth of roasted hen jus, accompanied by recently harvested peas just bursting with sweetness. 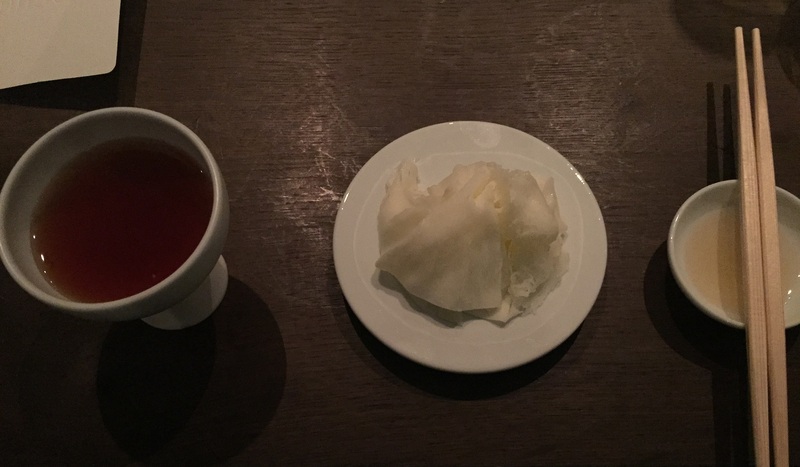 The mantou, like bao, is a steamed bun, but it's wholly solid with no filling. It's just flour, yeast, and a little sugar. Sometimes scallions are scattered in the dough, Lee uses black truffle flakes. In Latin there is a phrase called magnum opus, which roughly means greatest work. Beethoven's Eroica, Van Gogh's Starry Night, Einstein's Theory of Relativity. 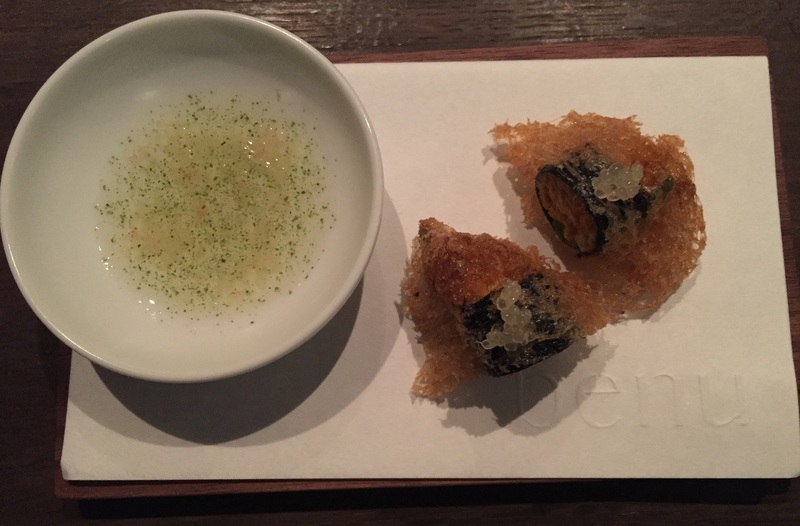 This dish is Benu's magnum opus. If you've ever wondered who enjoys their food more, the self-professed taco truck foodie or the jaded restaurant critic, ask yourself who (generally) enjoys the act of living more, the child or the adult. Some adults - the dreamers - vainly continue seeking that magic feeling of being a child. Many others forget what it was like, or cast the quest as worthless, foolish. I don't blame them; it's hard, often disappointing. Yet sometimes you find it. This is one of those dishes that reminded me why I like eating so much. Its genius breakthrough is not one of flavor, but one of aroma. With every piece I tore off, I pressed my nose into the freshly-excavated mantou and was transported to a better place. In those moments, everything was okay in the world. 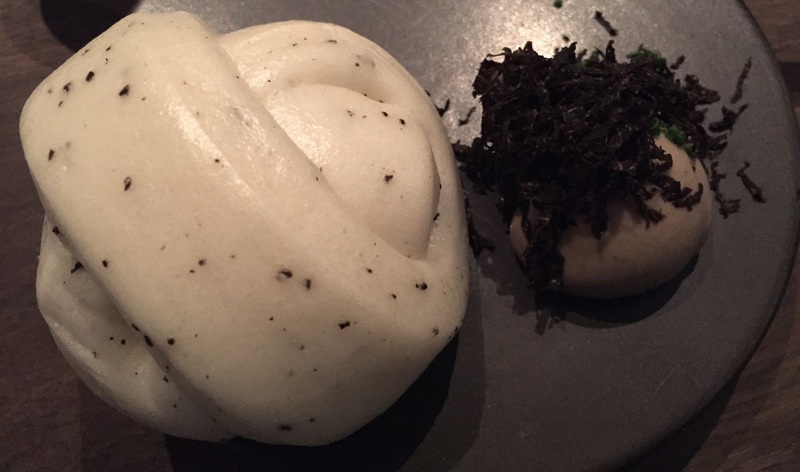 The soulmate of mantou is the black truffle. How did Lee figure this out? Maybe he took the Thomas Edison approach: "There's a food I really want to play with, how can I make it better? Let me test as many combinations as possible." Maybe it just hit him one day, a random epiphany born of a lifetime of experience. Whatever the means, the end is equally sublime. Sometimes I imagine having a "final meal" after which I would eat no more; this would surely be one of the courses. Didn't get enough beef rib when I waxed about barbecue? Here's some more, this time broiled or cooked sous-vide or something. Nothing was wrong with this except for its being unmemorable (god, what a terrible word). 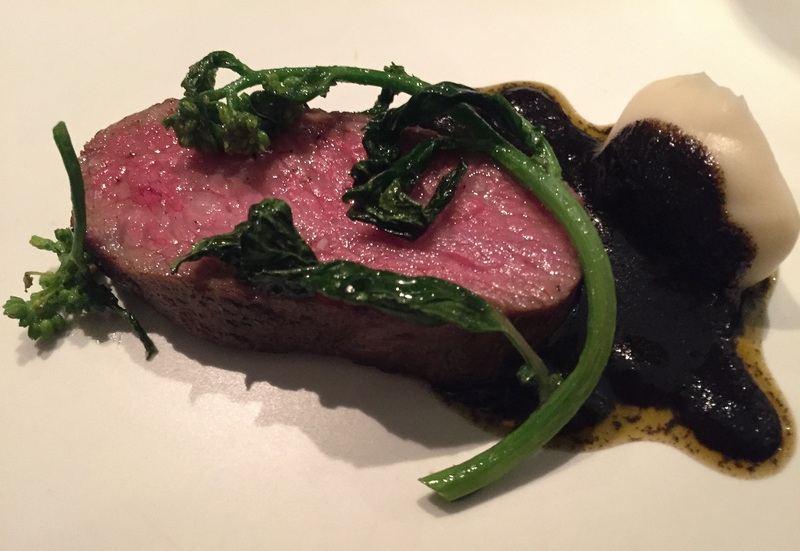 A stalk of rapini grasps at the meat, like a hydra trying to eat an elephant. The charred scallion sauce and eggplant purée were relatively uninspired and won few points. Benu should avoid steakhouse fare! Everyone's seen Gordon Ramsay's viral video: on one hand a stunning exposé of capitalism-fueled animal cruelty, on the other a tone-deaf media ploy in which he barges into one Chinese family's birthday dinner and lectures them about the dish's immorality. I've had shark fin soup in China before and I thought it was delicious. But as he hints in the video, my judgment had most likely been based on the broth - traditionally, a rich and fragrant saffron - and not the shark fin itself. In this way diners may associate the flavor of the broth with the shark fin, and thus come to love the shark fin because it always comes with tasty broth. A convenient hypothesis, but not accurate. Shark fin soup dates back hundreds of years to the Ming Dynasty. It's basically a Chinese cultural artifact. For better or worse, the Chinese tend to be a particularly proud people who like to feel powerful - the idea of subjugating that mighty predator of the ocean and reducing it to a dish must seem quite enticing, seductive even, a representation of man's triumph over beast... Yet they pay it enough respect to reserve it for special occasions (either that or the economics prevent frequent consumption). Arguably the shark fin is the paragon of Chinese gastronomy: a total emphasis on texture, casting all flavor aside. The question becomes: Can I, in good conscience, continue eating shark fin soup knowing about its vicious supply chain? Of course not. Neither can Chef Lee. I'm willing and happy to sacrifice a cultural artifact based on artifice so more sharks can be saved, so more ecological harm is prevented. ...But what if we can artifice the artifact? That photo above, it's not real shark fin. Its fabrication involves, among other things, sodium alginate, locust bean gum, sodium hexametaphosphate, gellan gum, and calcium chloride in various different proportions, in various different preparations (temperature, time, methodology). If I mentioned Lee was a genius before, now you're forced to believe me. But why spend all this research and effort to artificially recreate an ingredient the great Gordon Ramsay says "tastes of nothing, almost like plain glass noodles"? The answer is the quote at the top of this piece. Shark fins in soup are like thicker, firmer glass noodles, also gummy, snappy. Lee's version, here resting atop some sinewy Dungeness crab meat, eats exactly like the real thing. 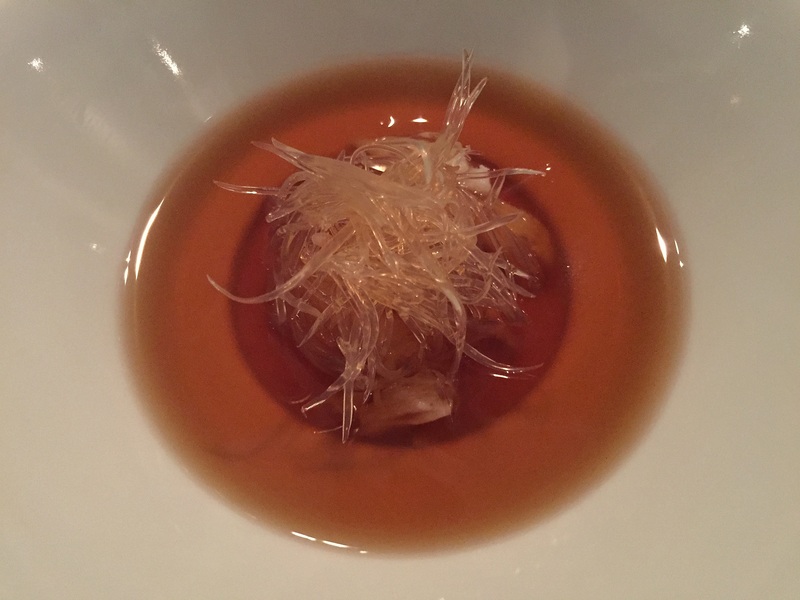 A custard of Jinhua ham below the crab oozes some extra umami into the warm broth. The cup on the left contains kombucha, an effervescent beverage produced by letting a large (enough to be obviously visible) colony of bacteria and yeast ferment sugar tea for a week or so. If you knew that, I have some news: you're officially a hipster! I tasted some honey and ginger in this one, for which the waiter gave me cred (yay), and also some smokiness. If you haven't tried kombucha before, grab some GT's from your local Whole Foods anywhere store - it's mainstream enough now - the original version is still their best. Better is Lion Heart Kombucha from Portland (what did you expect), best is Kosmic Kombucha from Austin TX (also a hipster capitol). The "shaved milk" in the center here came as a complete shock. Imagine several tablecloths thrown together in a haphazardly-stacked pile. Now imagine yourself removing each tablecloth, layer by layer. That's essentially the concept here, except you use chopsticks instead of hands (the only dish for which chopsticks were provided! ), and semi-frozen sheets of milk instead of tablecloths. Each sheet, being so thin while having a large surface area, instantly melts as you place it on your tongue, releasing a sweet burst of milky flavor. A delightful feat of culinary engineering. The cup on the right contains a pool of honey, into which you can dip the milky sheets to enhance their flavor and viscosity. What is the key to life? Set low expectations, shatter them. I was not. happy. when this dessert came out. "Gee whiz, another ice cream dish, groan, really Benu? I guess we're both bad at saying goodbye." Yuba is tofu skin. I officially name this dish this the Three Paths to Yuba, on second thought, Alien Egg is probably better. 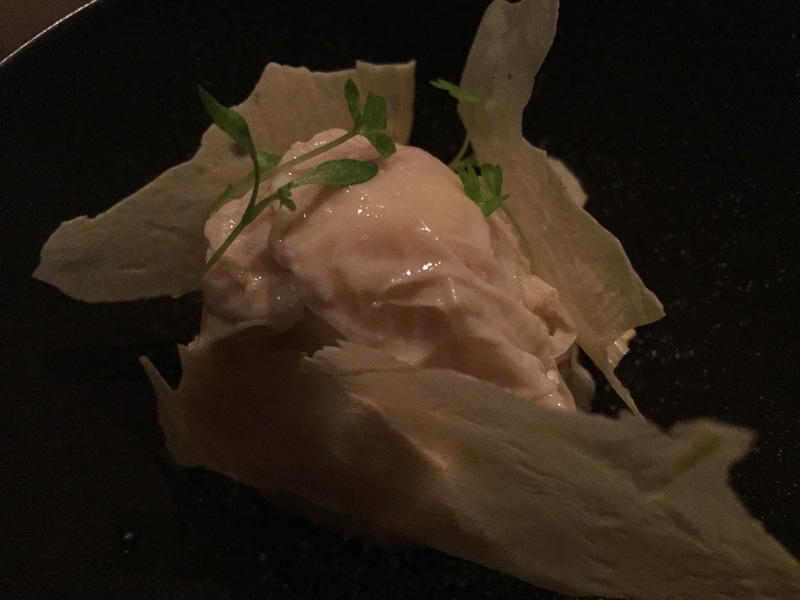 Surrounded by three crisp yuba sheets is a white chocolate ice cream, but wait, look carefully and you see there appears to be something on top - yes, it's a glistening yuba layer protecting the ice cream. You have to eat it before you can dig in; it's super thin but manages to be chewy somehow, which is interesting. Now you can start eating the ice cream. But wait, after you take a bite or two of the ice cream, suddenly it gets crunchy. What's going on!? Little almond shards, disguised, litter the landscape. Their nuttiness is the perfect flavor complement to the cocoa butter vanilla of the white chocolate and their crunchiness is the perfect textural contrast to the creamy cold of the frozen dairy. 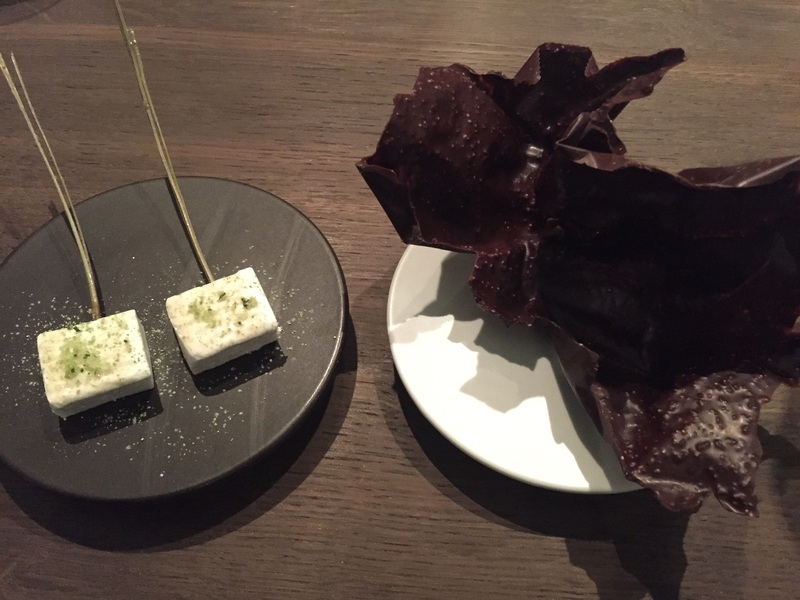 Can't go wrong with a couple marshmallows dusted with matcha sugar and a jagged crag of a dark chocolate wafer interspersed with crispy rice (hello CRUNCH). All I can say is: I hope it's adiós and not adieu. It's damn good, is what it is. Chef Lee, who is ethnically Korean, somehow groks Chinese culinary technique to such a degree that you'd find it difficult to compare his preparations with those of Beijing's finest establishments. If you pressed me, I'm perfectly okay with admitting Lee's are better. It makes sense once you think about it. To cook, you must first understand. First a recipe, perhaps passed down from your parents. Cook it enough times and you get better at it, it starts to taste better. Next, how ingredients work. When they are in season, how they are grown, how to identify their best specimens, how they taste fresh, pickled, prepared, how they might function in a dish. Finally - and this is the hardest - you have to understand the why. The ingredient might be edible, but why do people eat it? Does it taste good? Does it represent something? If so, what, and to whom? What does it mean, anthropologically, socially, culturally? Even some of the most lauded chefs fail to understand this why. Many put years in the kitchen and make great tasting food, but eating it can feel soulless and clinical. Others, like the modernists, forgo tradition altogether and wildly experiment attempting, often failing, to find new inspiration in science. Those who do get it - and these exist at every level, from hole-in-the-wall to haute cuisine - are able to make you feel something through their cooking. You want to come back because the food stays with you in memory. Lee gets it. He just gets more of it than most other chefs who get it. 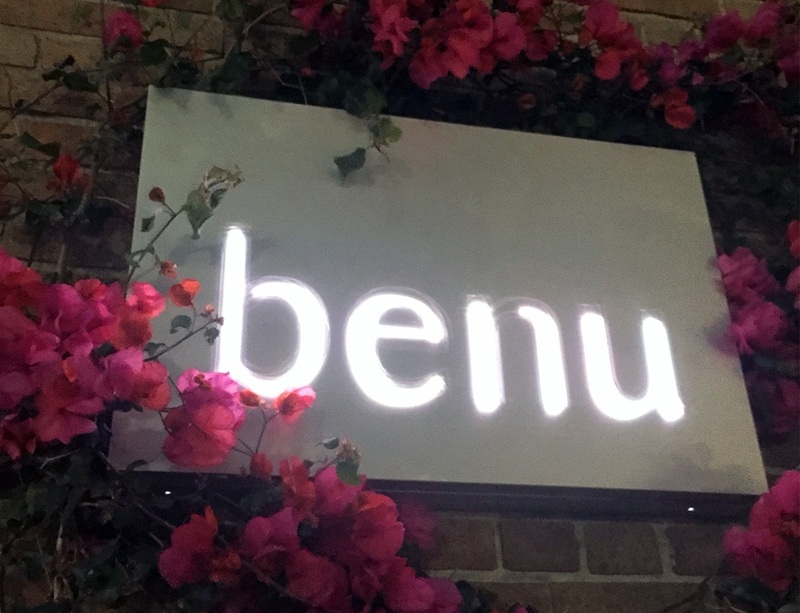 That's right, Benu is a fusion restaurant, born of France, Korea, China: past and present, ingredient and technique. Pretend like you never read this post and try to imagine what a restaurant described as such could look like. I know I'd be highly, highly skeptical; my curiosity would be piqued, but my instinct would tell me not to go, based on all the times I've been burned by fusion restaurants. And let there be no mistake: American Chinese food is fusion food. Break it down: American. Chinese. Unfortunately its base tier, born out of economy necessity instead of culinary curiosity, doesn't hold much weight in the gastronomic arena. Yet great fusion, which pushes the envelope instead of catering to the lowest common denominator, cannot have existed without General Tso, without the generations of immigrants who, in the process of following their dreams for a better life, cultivated America's tastes and birthed new cuisines. In a way, Benu represents the pinnacle of their achievement - and it is fittingly stationed in California, where it all began. Benu is an American restaurant.